We are truly grateful to the witness of faith, holiness and spirit of prayer with which Pope John Paul II has led the Church during these past 26 years of his pontificate. In particular we are most grateful for teaching us how to love our Lord truly present in the sacrament of the altar. As an archdiocesan association entrusted with the task of opening chapels of adoration within our parishes, we could not have chosen a better name with which to name ourselves than his; for it is he who by his teaching and personal example has encouraged us to unselfishly persevere in this ministry for the greater glory of God and the renewal of the whole Church. 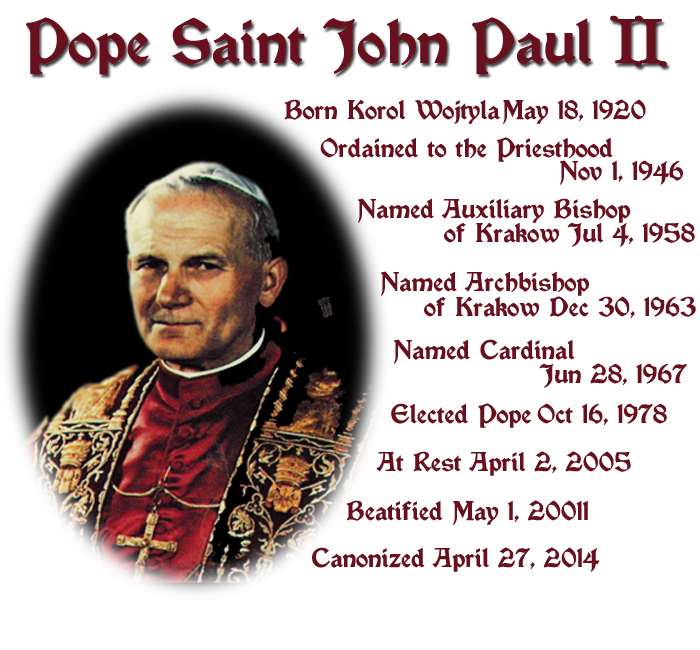 Holy Father, we love you and we now look to you to continue to guide and shepherd us from your abode in heaven. What Pope John Paul II Himself Says About Eucharistic Adoration. The worship of the Eucharist outside of the Mass is of inestimable value for the life of the Church . . . It is pleasant to spend time with Him, to lie close to His breast like the Beloved Disciple and to feel the infinite love present in His Heart. If in our time Christians must be distinguished above all by the “art of prayer,” how can we not feel a renewed need to spend time in spiritual converse, in silent adoration, in heartfelt love before Christ present in the Most Holy Sacrament? How often, dear brothers and sisters, have I experienced this, and drawn from it strength, consolation and support!. . . The presence of Christ under the species reserved after Mass – a presence which lasts as long as the species of bread and wine remain – derives from the celebration of the sacrifice and is directed towards communion, both sacramental and spiritual. It is the responsibility of Pastors to encourage, also by their personal witness, the practice of Eucharistic adoration, and exposition of the Blessed Sacrament in particular, as well as prayer of adoration before Christ present under the Eucharistic species. . . This is an aspect of the Eucharist which merits greater attention: in celebrating the sacrifice of the Lamb, we are united to the heavenly “liturgy” and become part of that great multitude which cries out: “Salvation to the Lamb!” (Rev 7:10). The Eucharist is truly a glimpse of heaven appearing on earth. It is a glorious ray of the heavenly Jerusalem which pierces the clouds of our history and lights up our journey . . . and plants a seed of living hope in our daily commitment to the work before us. . .
Let us take our place, dear brothers and sisters, at the school of the saints, who are the great interpreters of true Eucharistic piety. In them the theology of the Eucharist takes on all the splendor of a lived reality: it becomes “contagious” and, in a manner of speaking, it “warms our hearts”. Above all, let us listen to Mary Most Holy, in whom the mystery of the Eucharist appears, more than in anyone else, as a mystery of light. Gazing upon Mary, we come to know the transforming power present in the Eucharist. In her we see the world renewed in love.